A cask-strength whisky given to Manuel for his birthday: a nose of burnt bacon, followed by memories of a sweater you wore by the campfire last summer, rounded out with a rusty barbed-wire fence and the scent of wet asphalt on a Tuesday morning. And you thought you knew whisky. Oh sure, you probably knew that there is whisky without an ‘e’ from Scotland, whiskey with an ‘e’ from Ireland, whisky from Canada and the US, whisky from Japan, and whisky perverted into things like bourbon and rye by people who thought they could make a good thing better. You may know that whisky can be distilled once or three times; it can be single malt or blended, it can be aged in casks that previously held sherry, port or rum, and it can be reasonably affordable or unfathomably expensive. You probably even know it has varying flavor profiles, running the gauntlet from throat-scratchingly smoky to deliciously smooth, sweet and mild. But I’ll bet there’s some things about whisky you don’t know. If you’re a wine aficionado you know that there is an entire vocabulary connoisseurs use to describe their favorite libation: fruity, jammy, leathery, oaky, chewy, floral, peppery, round, lengthy and complex are all common terms used to attempt to pin down wine’s elusive and enigmatic qualities. If you’re just an occasional drinker you probably scratch your head when reading such descriptions on the label, thinking, well, to me it tastes like WINE. Maybe a little sweeter at times, maybe a little vinegary at others (depending how much you forked out for the bottle), but all those fancy adjectives just seem like they’ve been made up to keep sommeliers in a job. Well, have I got news for you. Did you know that in terms of vocabulary, in terms of nuance, and in terms of lunatic imagination, the world of whisky tasting has the world of wine tasting beat hands down by about a BILLION to ONE? Take the Scotch Malt Whisky Society as an example, an international membership organisation with headquarters in Scotland that specialises in buying single barrels of particularly good cask-strength whiskys, bottling them under their own label and making them available to members for purchase. Each barrel they acquire goes through a rigorous evaluation process by their panel of tasters before being given the seal of approval. After making their final selection, the tasters write up summaries of their findings, ostensibly to give members a head start on deciphering the subtle nuances of each bottle. These tasters have evaluated the finest whiskys in the world, and they have the vocabulary to prove it. Luckily for us, the Society releases their tasting notes to the public. Below are some excerpts cobbled together from their voluminous archive of notes, accessible to anyone through their website. There is no joke here; each and every description below has appeared in their (very reputable) newsletter. I must warn you – reading through them is like taking a bungee jump for the mind. You may never look at things (or at least at whisky) in the same way again. The nose is wonderfully fragrant – marzipan and wallpaper paste, soap flakes and rose petals. It drinks well at natural strength, with a thick mouthfeel and an oily aftertaste. The taste is sweet, hot, mouth filling and long, like the sun on a heathery hillside. Enjoy a bumpy, exciting ride with a whisky that is old enough to know better. The nose is rich, deep and complex: reminiscent of well-worn church pews, hymn books, and even a distant trace of incense, but not musty. The first taste is of shellac and bay rum, with ripe peaches and over-ripe bananas. This resolves into boiled candy, before becoming deliciously waxy with expensive furniture polish. The first impression on the nose is Kit-Kat chocolate, still in its wrapper. The palate continues in the same vein with a burnt twig finish. The unreduced nose evokes orange peels, cooking chocolate and the caramelized part of an upside down cake, all sitting on top of a leather armchair. The first nose is of ashes in a grate, wet paper, ground cloves and dead wood. The flavour is peppery, with cigar boxes and pencil shavings. Behind this is a light phenolic note of band-aids and crepe bandages. Water brings up the Speyside character, but there remains a slightly musty, mossy note, or, as one panel member observed, the scent of a clean dog. The taste is deliciously mature and rich, with a little heat on the mouth, and a delicate hint of pencil eraser. Once diluted, ripe melon and bicycle tyre aromas appear. In the corner a girl wearing perfume is doing her nails. The initial nose is of peaches, soft toffee, ozone and dusty barns. Diluted, it tantalises with a touch of science classroom or the smell of skin after a swim. And then comes a baked pastry quality, fresh from the oven. A sweetly coy and charming dram with a frivolous wink. After a while the scents of a carpenter’s shop emerge: fresh wood shavings, wood glue, teak oil. Tasting at this stage is not advised: it is hot and fiery, with white pepper and chillies. Water unfolds the true character of the whisky: candlewax, scented smoke – think of a high church just after mass has concluded – with a light medicinal note, like a footbath in a swimming pool. Pass your nose over the glass and there is subtle smoke and pancetta – boy scouts are frying something nice in the forest. It is a glowing gold whisky and noses of oil and rubber and steam; standing on a bridge while the Flying Scotsman rushes beneath, or the wooden work bench at Swan Hunter’s shipyard. If you want to experience the industrial revolution in a glass, here it is. That’s pretty convincing stuff, eh? There’s obviously more to whisky than meets the eye. To find out how you too can become a member of the Society and try all these mind-boggling flavors for yourself, just click here to learn all about the membership opportunities in your country. Of course, you could just try heading down to your corner liquor store and asking for "something mossy, with a hint of old dog". They just might know what you mean. Ha! This is GREAT! You know, after reading perhaps the 3rd or 4th excerpt, I was ready to get out the 4 bottles of Scotch that my husband has so that I could come up with my OWN eloquent description. But then it’s quite 4:30pm and he’ll be walking through the door in 45 minutes. Not a good idea. 😉 I will have to print a copy of this for my husband and read it to him with the best Sean Connery accent that I can muster. It will have him rolling on the floor. If only we already had the westie pup to join in on the silliness! Hi Rowena! Sounds like a plan to me – four bottles of booze and an afternoon all to yourself! 😉 Seriously, I wonder what kind of interview these tasters had to undergo before getting this job – must have been hours spent blindly sniffing different types of furniture polish, wallpaper paste and dogs! Let me know if you find any hints of these among your four bottles…Hi Michele! So you’ve never tried whisky? Well WHAT are you waiting for?? 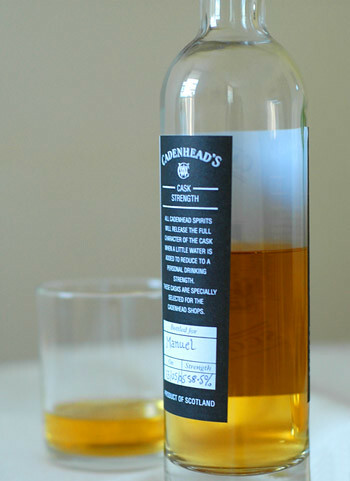 I actually didn’t like whisky myself until someone gave me a tip on drinking it – don’t breathe in while taking a sip. Take a small sip, swallow, then breathe, and you’ll get a rush of flavor without the overpowering scratchiness. It’s foolproof, as long as it’s a decent whisky. Adding a bit of water can help tone it down as well, but I usually drink it straight. If you’re tempted to try, some of my favorites (which should be available in bars) are Highland Park, Oban, Macallan, Glenfarclas and Glenfiddich. None of them are smoky, which can be a difficult flavor to get used to. If all else fails, whisky goes quite nicely with coke 😉 Let me know what you think! Regarding water, don’t add it to tone it down — add it to increase the flavor! Try this experiment:Put a shot of whiskey in a glass, swirl, and inhale the aroma. Now, a few drops at a time, add some (warm, neutral tasting, spring) water and swirl it around. After a certain point (depending on the whiskey), it will suddenly “open up” and all of a sudden the nose will blossom with all sorts of elements that weren’t there before. It’s really cool! Totally changes the nature of the drink.